Considered the top choice of professionals everywhere, RCMA Foundation is a staple in many an artist's kit. The last thing Vincent Kehoe of the Research Council of Makeup Artists wanted to do was create more of the same in the world of foundations. It was this desire that revolutionized the world of makeup as we know it, spawning the now-legendary RCMA Foundation. A professional, highly pigmented, blendable cream base that is formulated without perfume, mineral oil or lanolin, RCMA Foundation is ideal for photography, film and anywhere high-definition quality is needed with a finish that feels light enough for every day wear as well. Not sure what color you need? Buy a sample! *Versus commercial liquid foundations ratio (18-23% pigment to liquid) and theatrical foundations (30-35% pigment to waxes and oils) **Most theatrical foundations contain mineral oil or petrolatum as major ingredients. RCMA delivers great coverage without a heavy thick makeup feel. It also doesn’t clog pores. Allissa C. Reviewed by Allissa C.
Caitlin N. Reviewed by Caitlin N.
GREAT Foundation! The color was slightly off.. I love this foundation. I will never go back. I purchased this because I had purchased the #11 palette and wanted to get my closest shade match (CS-2) to mix so that I didn't use up the whole pan. 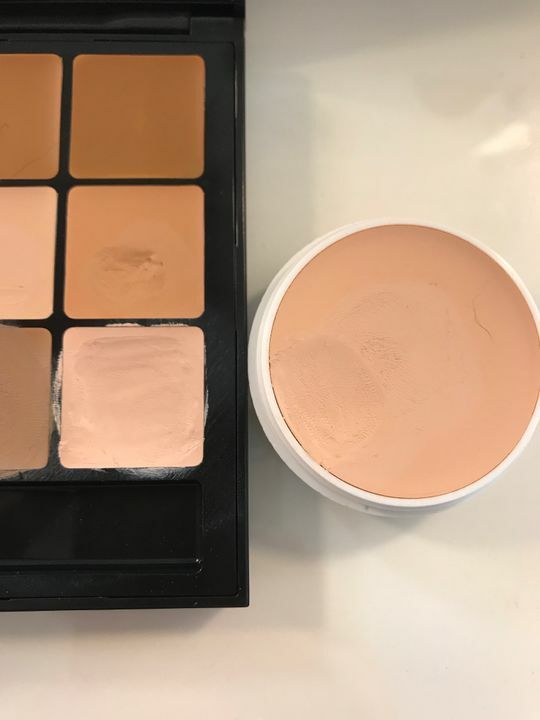 I was wondering why I was mixing in so much of a lighter shade after using this, so I put them side-by-side. Sure enough, the shade was just a tad darker. It looked like I had mixed CS-2 from the palette with a little bit of Tantone. Contacted CRC and they said that they didn't notice any difference after sending them several pictures. Then they told me that I needed to mix the pan because of the way the pigment settles. Well, that didn't seem to change anything. Oh well... I'll just continue to mix in more of a lighter color for now and go for the CS-1 next time. I just discovered this website. So pleased. I model and have done commercials as a hobby. Many times I have to be “camera ready” meaning no stylist to do my makeup. I am 64 and through the years have picked up tips from the pros but no one ever mentioned RCMA before. I tried a sample of shade GB (I am blonde with light toned skin, neutral undertones). The shade blended in. This is a cream type foundation and it lasts. I use a foundation brush and blender. As I age and have more lines, the right foundation is important to me and I really like the coverage of this.